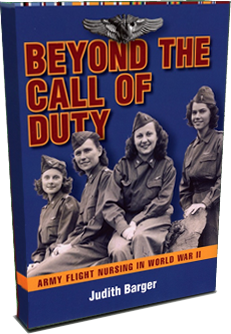 For the 25 flight nurses interviewed for Beyond the Call of Duty: Army Flight Nursing in World War II, wartime service was beset with potentially difficult circumstances that could exact a toll on even the most hardy of nurses. To cope with these professional and personal challenges, these women drew on many sources of support, tangible and intangible, physical and mental. Social support, one’s physical condition, and abilities and skills fostered in nurses’ training all helped the flight nurses cope behaviorally with the multiple demands of the war. Reasonable expectations, devotion to duty, an optimistic outlook, and faith in one’s God, one’s colleagues, and one’s self all helped them cope emotionally with the war. The often primitive conditions in which flight nurses lived and worked, as well as the demands of air evacuation duty, required a great deal of physical stamina. Keeping busy was important to surviving the rigors of wartime service. When on transatlantic flights, Jenny Boyle, assigned with the 816 MAES in England, was surprised “how much time you can spend without doing anything spectacular, just by being there and helping out and talking with the patients, but you stayed busy for the whole time.” Elizabeth Pukas, chief nurse of the 812 MAES in the Pacific, recalled the simple joys of well-earned crew rest the first 24 hours after landing, making her report, off-loading the medical equipment, and returning to her home base. 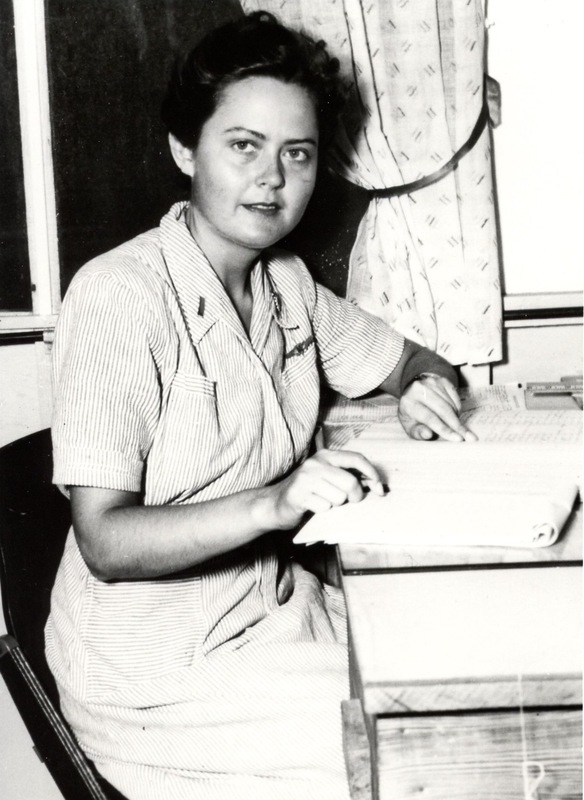 Mental exhaustion – which flight nurse Hilda Halverson, assigned to the 826 MAES and later the 830 MAES in the Pacific, described as always being alert thinking “what you can do for the next person” – was not as easily remedied, though overall good health helped. Matters of hygiene, including health concerns, were the most frequently discussed demands of the flight nurses’ living conditions. While most flight nurses maintained their health during their air evacuation assignments, many of the nurses were plagued by minor ailments such as diarrhea, constipation, bladder infections, and skin fungus. 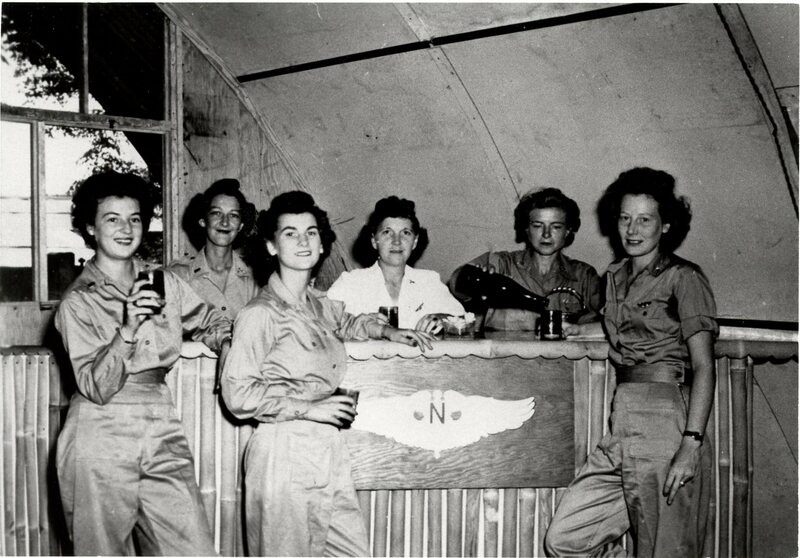 The flight nurses continued to work despite their discomfort, often to the point of exhaustion. Irregular hours accounted for much of the indisposition. Flights could be as short as a 40-minute English Channel crossing or up to 20 hours long on a transoceanic mission. Food was nonexistent or unpalatable, served from a back burner of a stove in the mess hall, by a Red Cross worker, or in a container of C-rations or K-rations. While most flight nurses learned to sleep while deadheading on a flight with no patients, these naps did not compensate for a full night’s sleep on the ground. Crew rest varied in length depending on plane schedules and the number of patients needing evacuation by air. Two of the nurses I interviewed returned to the United States as patients because of health problems; both were assigned in England. Ethel Carlson of the 815 MAES had a kidney flare-up; Louise Anthony of the 816 MAES could no longer tolerate a back injury she sustained during the flight nurse course when she had to lift a litter with two 60-pound sandbags on it. She hid the fact of the injury as long as she could, because she realized it would disqualify her as a flight nurse. Most airplanes did not have any toilet facilities. If you were lucky, and you had a long flight, there might be a pail in the back that we had to use. It is possible for a nurse with slacks on to aim at the pilot’s relief tube, but, believe me, it’s very difficult, and you have to hope that the plane is going to fly steady while you’re there! White remembered another bathroom arrangement, on the ground. When no facilities were available for women when the plane landed in Naples, a medical officer “would come up to the airplane, and across his jeep was a sign, ‘To the bushes.’ And we would all get on the jeep and go off to the bushes.” The flight nurses carried their own toilet paper with them. In Rome the flight nurses had an outhouse, which they painted blue and named “the blue room.” But, as White recalled, some of the soldiers on one field felt sorry for them. And we got over there one day, and they said, “We’ve got a surprise for you!” So we went, and they had made us a beautiful six-holer. Someone had made us the fanciest toilet-paper holder you have ever seen. They had a stone walkway around so that the entrance was [in] back out of the way, and they even had some flowers planted around. I mean, it was the most up-to-date facility in the whole theater. Nurses occasionally ran out of sanitary napkins. Some locations lacked post exchanges or towns in which to buy more. Chief nurse Lucy Wilson of the 801 MAES recalled flying on a mercy mission to another island in the Pacific to stock up on Kotex for the nurses in her squadron. So here we were, a bunch of women bemoaning the fact that we wouldn’t get anything for Christmas, so we made each other little Christmas presents. I remember somebody dyed – I don’t know how they dyed – a bra purple for me. That was my present. … But we all made each other something or stole something from them and did something to whatever they had. 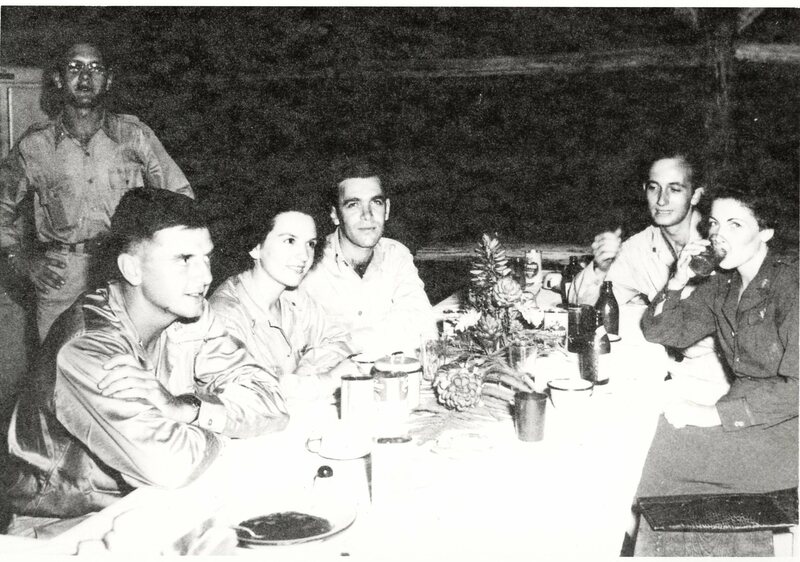 Their Christmas tree was very saggy and looked like a weeping willow, but the flight nurses decorated it with whatever they could find, including spoons from the mess hall. But the coup de grace, Holt said, was a package from the Red Cross – a man’s sweater for a female nurse assigned near the equator, about the most useless gift possible. And on this one particular day, I think it was the twenty-third of December, two girls went out – myself and another girl that was our turn to go. And we were carrying blood and medical supplies. And just as we got down to the coast … the crew chief or the copilot came back and said, “Get into a parachute.” And he was getting into one. We’d lost an engine. …. I kept thinking, Do I get out of this parachute before we hit the water? Because I knew we had been gone long enough to be over the Channel. Or do I hit the water with the parachute? That’s when French wished she’d remembered a little more from her parachute training. Fortunately the plane was able to make it to a base on the British side of the Channel, where the crew stayed overnight until the engine was fixed. So I went down, and that was a happy day. I went down and had a hot bath and slept between sheets that night. And the next morning I got up and took a subway back to Orly Field [near Paris], and that was Christmas Day, I guess. … [We] stood in line in the open. They had dinner prepared in tents. But we had Christmas dinner, and then we left that afternoon, and we did not take patients back. … I got home the day after Christmas, and the weather had cleared up just miraculously, and every one of our girls had gone out, and I was rambling around in that big building all by myself. And it was December twenty-second. We began to think we were going to make it out the twentieth, before Christmas. And the Germans and partisans started fighting up and down this valley that we’d gotten into. It was kind of decent terrain, but it was between river and roads. And we didn’t know how far the fighting would spread, so … we backtracked for a couple of days, to get back across the river, across the road, and up in a higher mountain. We could see this town of Gjirokastër, which is one of the larger towns, too, and we’d stayed there one night. But the Germans occupied it the day after Christmas. … And then the weather socked in for 10 days. … So we just sat in this town waiting over Christmas. The travelers finally made it to the coast, where a boat returned them to Italy, after the New Year. See Beyond the Call of Duty for more about the flight nurses’ time in Albania. Social support from squadron and family members was a key element in dealing with the demands of war. 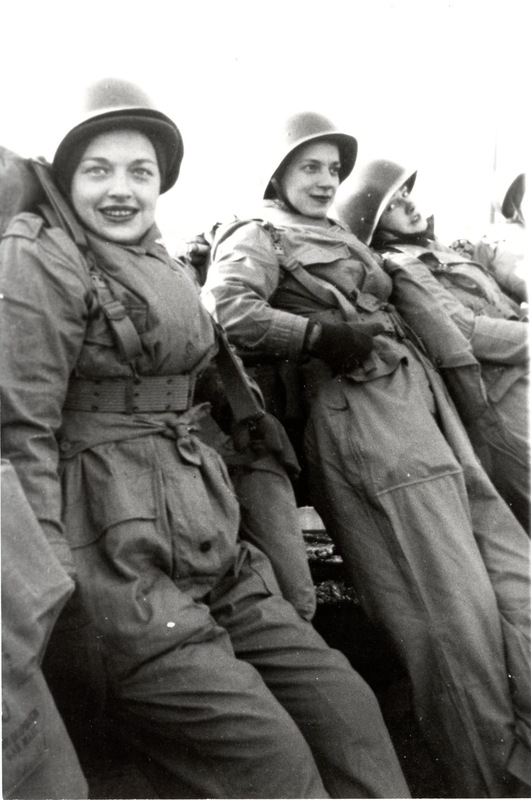 Almost two-thirds of the flight nurses interviewed mentioned the importance of esprit de corps and camaraderie in helping them through the war. To four flight nurses it was like a family relationship. 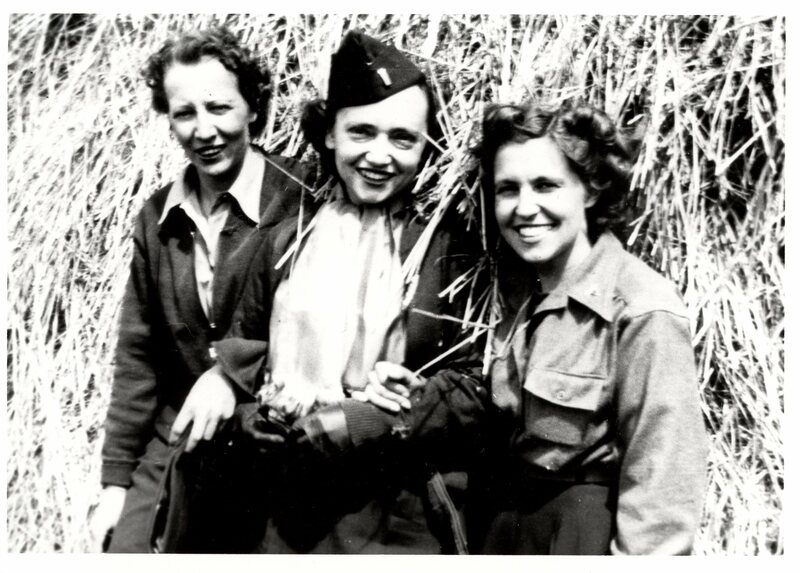 What Jenny Boyle, stationed in Europe with the 816 Medical Air Evacuation Squadron (MAES), found helpful was that the people she was with were “like a family.” The other flight nurses often were viewed as sisters. 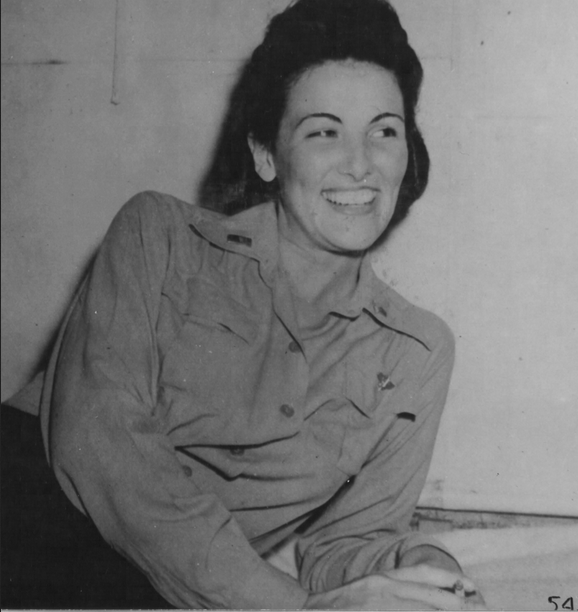 To Randy Rast assigned to the Chine-Burma-India (CBI) Theatre with the 803 MAES, the flight nurses in her squadron “seemed more like sisters to me than my own sisters.” Clara Morrey, initially stationed in North Africa with the 802 MAES, turned down a chance to accompany a patient back to the United States, because she might not have been assigned to her own squadron on her return from the temporary duty. The esprit de corps extended to other members of one’s squadron and to one’s colleagues in flight. Flight nurses praised the work of the medical technicians and emphasized the importance of teamwork in providing patient care. “The rapport between the corpsmen and our flight nurses was magnificent,” said chief nurse Elizabeth Pukas, whose 812 MAES was stationed in Hawaii. “Oh, it’s a team – it was definitely a team,” she added. Good leadership contributed to esprit de corps and fostered teamwork. Rast spoke of an exceptional commanding officer who saw to unit morale. Grace Dunnam, chief nurse of the 806 MAES in Europe, spoke of physicians and commanders who were “right in there with you.” A flight nurse in the Pacific stated, “I think our chief nurse was good for us. She didn’t nag, she didn’t pump, she joined us with our laughter, she joined us with our fun, she didn’t pick. 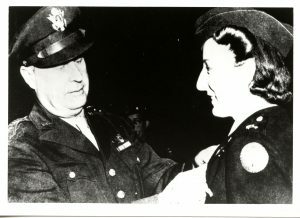 I think that she had something to do with our being content.” Louise Anthony, who flew with the 816 MAES, credited her good assignment in the war at least in part to the quality and fair-mindedness of her chief nurse who the flight nurses knew would always “go to bat right away” for her nurses. Several flight nurses mentioned the support and pride of family members, who could be relied on to send necessities such as casual clothes and underwear and to provide news from home in the form of letters and newspapers. Even the patients whom the flight nurse evacuated by air were a source of support. Dorothy Vancil, who flew with the 805 MAES in Central Africa, noticed how grateful the patients were for “everything you did for them”; for Morrey, “how appreciative these boys were as bad as they were … for every little thing that you did for them” helped her cope with the war. You never knew a stranger in the war, Rast remarked. Many flight nurses found that the war had its compensation in the people that they met during their military service. Five of the women interviewed met their husbands during the war. Other flight nurses befriended the natives in an overseas location, saw colleagues from their days of nurses’ training, and met up with relatives. For most of the nurses interviewed, an active social life helped see them through the war. 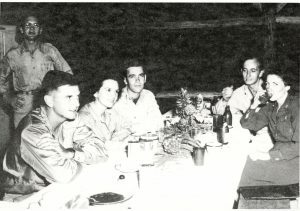 “We worked hard,” remarked Blanche Solomon, who flew with the 822 MAES and later the 830 MAES on the North Atlantic run, “but I think most of us played hard, too, in our free time.” Hosting and attending parties, seeing sights in a foreign country, playing cards in the mess hall, and joining in a songfest – all in the company of friends – provided outlets to help take one’s mind off the war. Quarters in which the flight nurses lived gave some nurses an exercise in coping. The flight nurses often were billeted together in one large room or several of the nurses shared smaller rooms. Living quarters were often old buildings in poor condition converted to house the nurses. 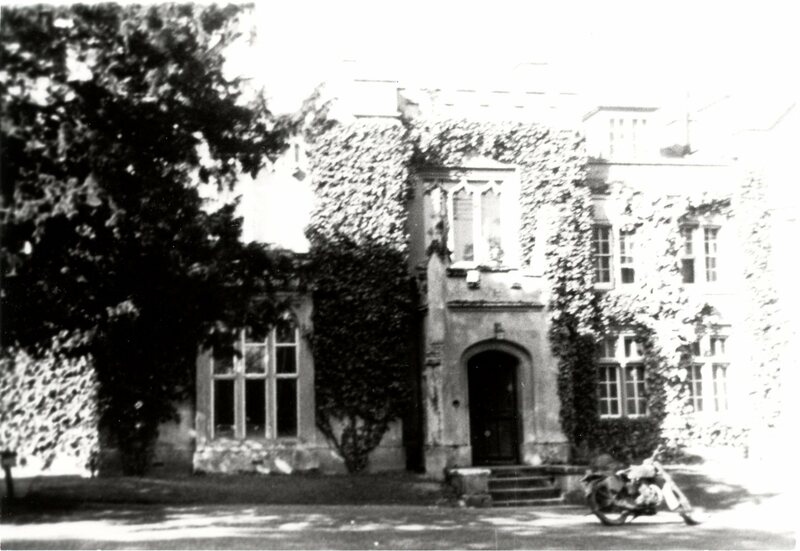 Jocie French, who was assigned with the 811 Medical Air Evacuation Squadron (MAES) in England, recalled living in an old, abandoned, dirty mess hall with vines growing inside through the windows and mice “all over the place.” The nurses had to clean up the building when they moved in. And they were still finding … stray Japanese around there. So when we got to the back door of the Quonset hut to go to the bathroom at night, … you’d call, “Guard!” And he’d come and walk you to the latrine. I bet he loved his duty during the war! Ethel Carlson of the 815 MAES in England remembered her first quarters, Boxford House, near Welford, as far from primitive. The flight nurses expected to pitch tents and instead found themselves in a gorgeous mansion with formal gardens on an acre of land. They couldn’t believe it – a great entrance hall, spiral staircase, heads of game on the walls, a marble fireplace. “And this was our own private little barracks,” she concluded. We had an outdoor shower, and the shower was a large drum, and it had holes in it. … And it was the shower that everybody used. So this one time I was in there taking a shower and went to rinse the water, and I see a face up there. Well … I screamed, and of course everybody came running. It was one of the fellows who hadn’t seen a white woman for so long. So from then on we wore bathing suits in the shower. Just how livable the quarters were often depended on the flight nurses’ assertiveness and ingenuity. 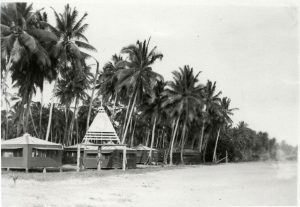 Elizabeth Pukas, chief nurse of the 812 MAES, was upset to learn that the 25 flight nurses in her squadron were to be housed in two three-bedroom houses on a base in Hawaii. I simply went to our commanding officer – flight surgeon – and said, “This is really asking a little bit much. Please get us another house so that three divided into twenty-four is a little bit more livable.” And then of course I was told, “Well, remember this is very, very temporary. All of you will be out in the Pacific.” I said, “Yes, but there will be a number of us having to stay home in between flights to recuperate, to refurbish, to repack. And this is just a little bit – a lot – of equipment, and our personal property, our clothes are still in the closet, our toiletries are still there. This is our living quarters. And I’m very sure you would not ask a male counterpart to live in such close quarters.” And we did get a little more adequate housing as time went on. … But it did take a little more than just speaking to our squadron. … I did have to go to headquarters to say, “I’m asking if the request has come in and what action is being taken.” I’m not too forward, but I am a chief nurse. … My flight nurses are extremely important to me. The amenities of home were also important to Pukas. Having obtained the third house eventually, she decorated the houses with paintings on loan from a local art museum and stocked the kitchens with good foods obtained from the nearby navy commissary. Oh, we were so frightened of snakes and bugs and stuff! But we lived with them. There wasn’t anything else we could do. … They were tremendous things! And of course I’m a coward about those things anyhow. Those are the things I think that were really hard to take, because we could laugh about everything else, but not that. You know, we lived out in the jungle, and we had very poor food. We all complained about the food constantly, because it was mostly stuff shipped from Australia, and the meat – we called it Australian bully beef. It was really canned meat of some sort, but it really was tasteless, so we got to the point we didn’t eat it anymore. And I think once they even sent us canned liver, but I’m not sure of that. But I know most of us survived on peanut butter. We were invited out lots of times to dinner by the navy, and it didn’t matter who invited you, you always went, because they always had the best food. We’d go with anybody to go eat a meal with the navy. You got to that point. And they would give us things, besides. They would give us canned stuff like Vienna sausages or Spam or something to bring home with us, and that was really great! Work experiences prior to military service varied, with hospital, clinic, private duty, and industrial nursing all represented. 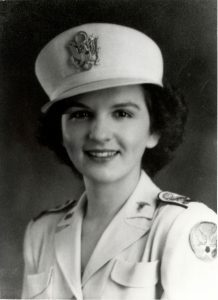 Dorothy White – eventually a flight nurse with the 807 Medical Air Evacuation Squadron (MAES) in the Mediterranean – considered this last type of job ideal preparation for flight nursing, because it involved emergency cases and responses when a physician was not in attendance and supplies were limited. About half of the nurses whom I interviewed already knew they wanted to be flight nurses when they entered the military; the others learned about this new field of nursing when at their first duty assignments. The opportunity to enter the military and serve as a flight nurse was linked closely with patriotism. “It was very easy to do,” said Louise Anthony, who had worked as a private duty nurse prior to joining the military. “There was no decision to be made. It had already been made. War had been declared. I had two brothers that would be in service. I had lots of cousins and nephews, my half-brother’s children. There was just no question. I was single. I couldn’t have stayed out had I wanted to.” Anthony later served as a flight nurse with the 816 MAES in England. When the Japanese bombed Pearl Harbor in December 1941, civilian nurse Elizabeth Pukas still had six months left on her contract with the Army Corps of Engineers in Antigua, where they were building the airfield that became Coolidge Field. As soon as she returned to her former job in New York City, Pukas was recruited by the Red Cross for military service and agreed to join with the stipulation that she be assigned as a flight nurse. But the military was too slow in granting her request, the impatient Pukas thought. “There is a big, big war going on, and it’s going on in the Pacific,” she told her chief nurse. When Pukas entered the army, she had been given a choice of where she would want to go if sent overseas. She answered, “Definitely not Europe, but the Pacific.” Pukas eventually got her wish. She graduated from the flight nurse course on 2 July 1943, was selected as chief nurse of the 812 MAES, and traveled with her squadron to Hickam Field, Hawaii just before Christmas in December 1943. Helena Ilic and Brooxie Mowery initially had dreams of work as a flight attendant with the airlines when a prerequisite for the work was a nursing diploma. But when America entered the war, and nurses were in such demand both in civilian life and in the military, the airlines stopped hiring nurses and changed their policy to require some college education instead. Ilic already was in the army when she saw a notice on a bulletin board concerning the need for flight nurses. “And, of course, I was all gung-ho, because, you see, before the war, that’s what I wanted to do,” she said. “The reason I went into nursing was I wanted to be a stewardess for Pan American. That’s the reason I went into nursing – to fly. And so the war broke out, of course – here I had a chance. I signed up immediately, and I went to Bowman Field, Kentucky.” Ilic later served with the 801 MAES in the Pacific. And while I’m waiting for this final interview, December seventh came along. And so I kept waiting and got through the holidays. And in January in the Midwest, you always get the doldrums because of the weather. So I got to thinking about it, and I remembered the letter I’d had from the airlines saying, “We’re awfully sorry. We have to change our program, because the armed forces need registered nurses now.” They wished me all kinds of luck. So I got to thinking, The armed forces need me? Okay. So I went down and started application and so forth. “I cannot seem to speak of flight nurses without sounding like a blurb for a flock of movie stars,” wrote Maxine Davis in a book about aviation medicine in World War II. “Frankly, I found the Army Air Force flight nurses tops. They were gay, friendly, loved their jobs and performed them efficiently, and they were beautiful. 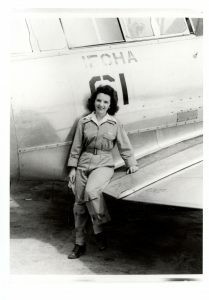 I am convinced the officials of the School of Aviation Medicine measured them, photographed them, and voted on them as for ‘Miss America.’ They were, incidentally, healthy, courageous, and stout of heart.” 3 Helena Ilic was just one of the numerous flight nurses meriting Davis’s accolades. Read more about Helena and her flight nurse colleagues in Beyond the Call of Duty: Army Flight Nursing in World War II. What kind of a girl is the flight nurse? Does she think in terms of capillaries, capsules and traction splints? Is she a spoiled woman who, socially, speaks only to Generals, Colonels and God – in the order named? She could be very spoiled. Quite suddenly, she has been transported into a world of men without women. She has been photographed and whistled at like Hedy Lamarr at a hermit’s convention. Although one could argue that the glamorization of flight nursing was overdone in the press, leading to resentment on the part of some of the flight nurses’ coworkers, the femininity inherent in such an image of the flight nurse served a purpose. Military officials would have found it difficult to discount the feminine image of the flight nurse that sold the air evacuation program during World War II. But to emphasize that image downplayed the professionalism of the flight nurse that was the real reason military officials had decided to use female nurses in the program. The answer was to portray these women as both glamorous and gutsy. This was the image that helped the sick and wounded soldiers cope with their battle wounds, injuries, and illnesses and, in turn, helped the flight nurses themselves cope with the professional and personal challenges of air evacuation duty in World War II. 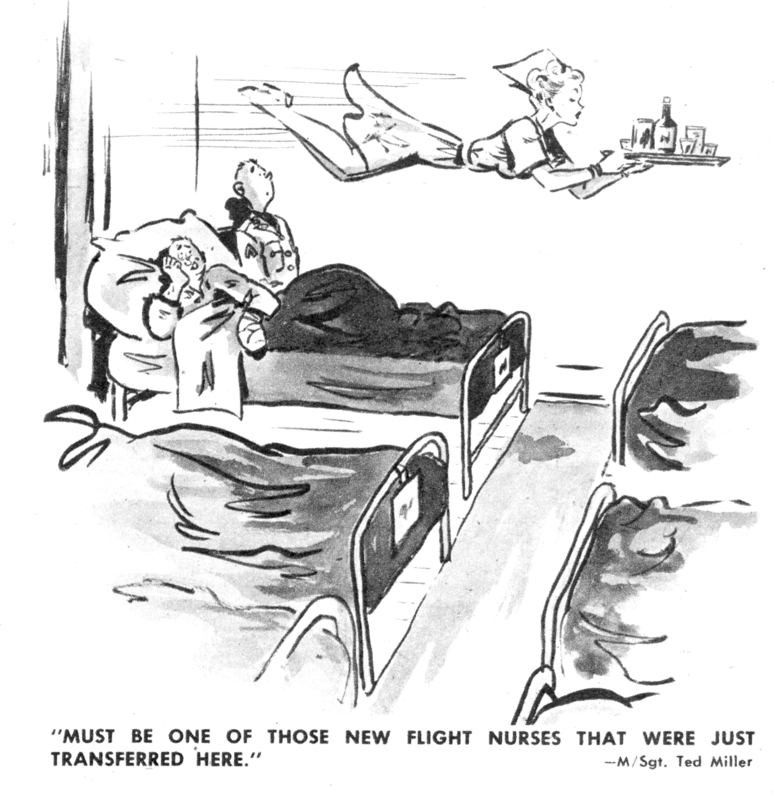 1 MSgt Ted Miller “New flight nurses cartoon’, Yank 1 September 1942, back cover. 2 Wm. [William] T. Lent, “AAF Medics,” Air Force 27 (July 1944): 51. 3 Maxine Davis, Through the Stratosphere: The Human Factor in Aviation (New York: Macmillan), 227. 4 Alfred D. Whelton, “A Heroine Comes Home,” Boston Advertiser, 9 September 1945. 5 M. Robert Halbouty, Attilio D. Puppel, and Charles E. Bybee, “Air Evacuation in the Combat Zone,” Air Surgeon’s Bulletin 2 (October 1945): 337. 6 Ed Edstrom and Joe Creason, “These Angels Fly on Man-Made Wings,” Louisville Courier-Journal ROTO–Magazine, 28 February 1943, 6. 7 Betty Peckham, Women in Aviation (New York: Nelson, 1945), 11. 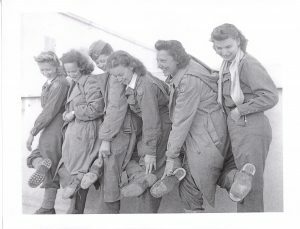 8 Marion Porter, “Nurses with Wings,” Colliers 113 (22 April 1944): 22. 9 R.S. [Roger Sheldon], “Far-East Flight Nurses,” and Benn F. Reyes, Paul Wheeler, and Roger Sheldon, “We Fly An ‘Air Evac’ Mission,” The Wing Ding [91st Photo Reconnaissance Wing, Philippines], 4 June 1945, 5–6. 10 Robert F. Futrell, Development of Aeromedical Evacuation in the USAF, 1909–1960, Historical Studies No. 23 (Maxwell AFB, AL: USAF Historical Division, Research Studies Institute, Air University; Manhattan, KS: Military Affairs/Aerospace Historian, 1960), 209. 11 June Sanders, “Unit History for Month of June 1944 – Section III,” 819 MAES, 1. 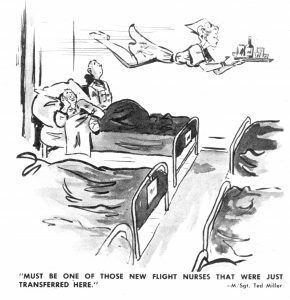 12 Joe Whitley, “Flight Nurses Are Women,” Brief 1 (14 November 1944): 10. 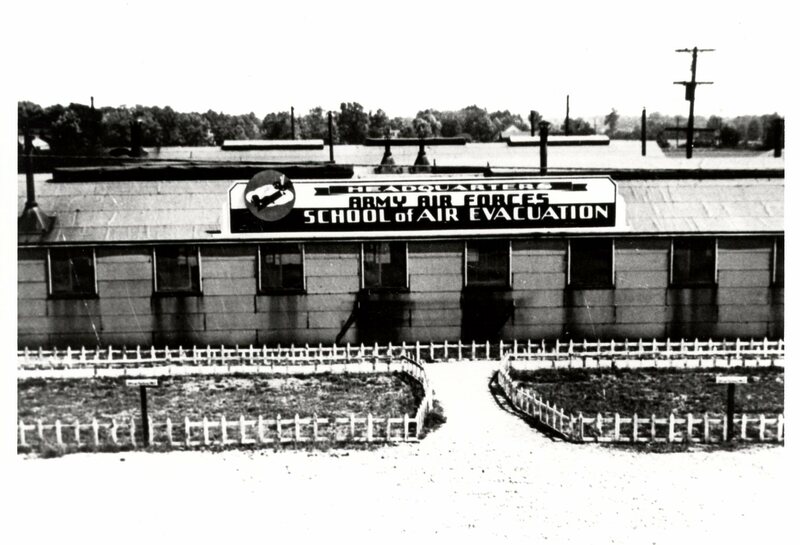 For some World War II army flight nurses, the interim between earning their wings at the School of Air Evacuation at Bowman Field, Kentucky, and participating in air evacuation in the “real world” seemed like an eternity. The nurses turned to poetry to vent their frustrations. Beyond the Call of Duty: Army Flight Nursing in World War II details the flight nurses’ training and their follow-on assignments. But orders are coming in slow. Because we are ready to go. We’ll help to defeat all those skunks. III. Major Kaplan is our C.O. She’s fair, square, and gives us no grief. On ten hikes since then we have walked. But lost bets galore all the while. They’re lettered A, B, C, and D.
Than sugar in coffee or tea. We swim, dive and clamour for more. The best men, and all on the beam. They’ll be there when needed. For jobs that are dirty or clean. So we’ll soon be sent overseas. And name Supply with a whoop! Orders could be slow in coming, but the 803 Medical Air Evacuation Squadron (MAES), like the squadrons that would follow, eventually did depart Bowman Field for the actual work of air evacuation overseas. One could forgive Lt Ott’s impatience, however; as a US Army hospital nurse in Karachi, India in January 1943, she had been selected to accompany five patients from Karachi, India to the United States in the first test of long-distance air evacuation, which earned her the Air Medal. At the conclusion of her historic mission, Ott requested and was granted orders for flight nurse training. Having already had a taste of flight nursing, Ott was eager to get back into the air. For more about that mission, see Beyond the Call of Duty. I wonder if you realize you’re very much worthwhile! Or turn (we hope) ‘subtle’ accuser. Attempting to crush the abuser. Of morning reports and S.O.’s! Suppress tempers no matter what goes. Stop court martials ‘fore they begin. You quiet the present’s mad din. As we pour forth this latest edition. Our bedding rolls were packed all ready to go. We surely fell sorry for – namely – ourselves. For new resolutions soon to appear. We will do our best no matter where stuck. We’ll try not to send our tempers amuck. God has given her a crown to hold. As she flew through the darkened skys [sic]. Had faith in her gentle hand. We naturally think of the men. When they offer their life for a friend. Its her I long to squeeze. While from her I remain afar. But to me it’s all so screwy. As I flew the Nurses home. Just flying the Nurses home. I’ll fly the Nurses home. 6 Alice Fraser, “The Lost Mercy Plane,” 817 MAES. 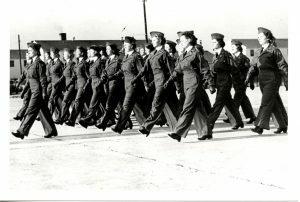 [AFHRA MED-817-HI] Reprinted in World War II Flight Nurses Association, The Story of Air Evacuation 1942–1989 (Dallas, TX: Taylor, 1989), 158–59. 8 Ilic Tynan, interview with Judith Barger, San Antonio, TX, 26 April 1986. 11 Robert F. Futrell, Development of Aeromedical Evacuation in the USAF, 1909–1960, Historical Studies No. 23 (Maxwell AFB, AL: USAF Historical Division, Research Studies Institute, Air University; Manhattan, KS: Military Affairs/Aerospace Historian, 1960). 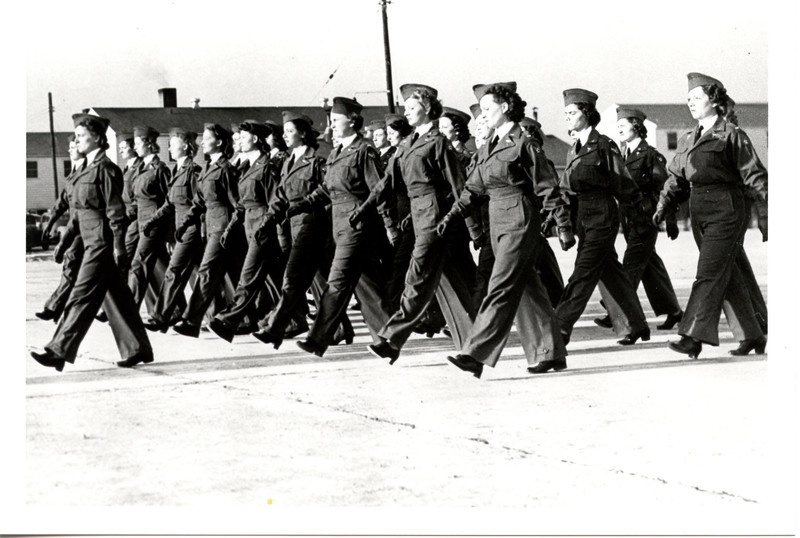 Training for World War II flight nurses at Bowman Field, Kentucky was a memorable event for those army nurses selected for air evacuation duty. 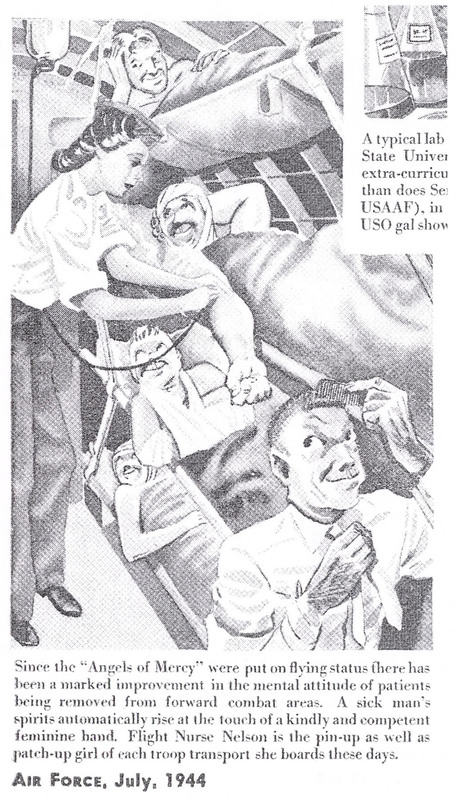 I detail that training in Beyond the Call of Duty: Army Flight Nursing in World War II. As we go flying on! We thought that the day’d never come. We’ll show them we’re all not so dumb. We’re anxious to frustrate the foe. Now won’t you take pity upon our sad plight? Oh, General, please let us go. The general to whom they referred was General David N.W. 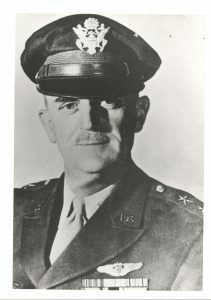 Grant, Air Surgeon, Army Air Forces, who had oversight of the medical air evacuation program, which he and his staff had instituted. And our superiority to no one will we yield. We’ll prove that we’re in earnest once our orders are unsealed. We can hold our own with the very best, as well as shoot and salute. If General Pershing could see us now, for us we’re sure he’d root. And, General Grant, we’re out to prove that what we’ve said ain’t hay. In the fight for vic’try as we fly the wounded back. We’ll all be back again. So we’ll be back again. All the fame of Air Evac that started as a dream. Till we come back again. A bag that all us nurses need up there. I’ll need a bag to fill up with some …… air. We’ll get this plane in readiness for war. Than stay and G.I. up the floor. Oh, I guess I should have bought a dozen more. I need a stomach made of iron ore. But it ain’t so tough as cleaning up this fact. Than stay to G.I. up the floor. Here’s to the friend of every Air Force Nurse. 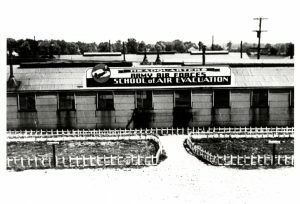 He helped to make the School of Air Evac. Let’s give a rousing cheer for General GRANT! Our mission is to bring our wounded home. We’ll be the greatest team the world has ever known. We’ll do our best and bring our boys through. He’s a good scout thru and thru. He made this the best of all schools. We will cheer him all the way. He is our AAF, SAE pride and joy. Stevenson had orders transferring him to Stout Army Air Field in Indianapolis as First Troop Carrier Command Surgeon. We will see this thru. To the ones they love. For the part she played. Ethel Carlson, Jenny Boyle, Brooxie Mowrey and Frances Sandstrom, graduates of that class, were sent to England, where they flew into Normandy after D Day, and all saw it through without losing a patient inflight. Each of these flight nurses is featured in previously posted blogs on 10 January 2015, 20 January 2015, 14 August 2016 and 18 December 2016, respectively. * All songs included in this blog are from the Leora B. Stroup papers archived at the AMEDD Museum at Fort Sam Houston, San Antonio,Texas. 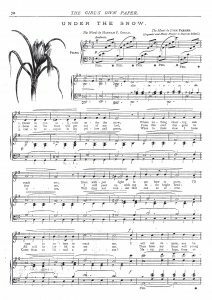 I have corrected obvious typographical errors found in the original typed documents and added missing punctuation when needed to make the songs more readable – and singable. 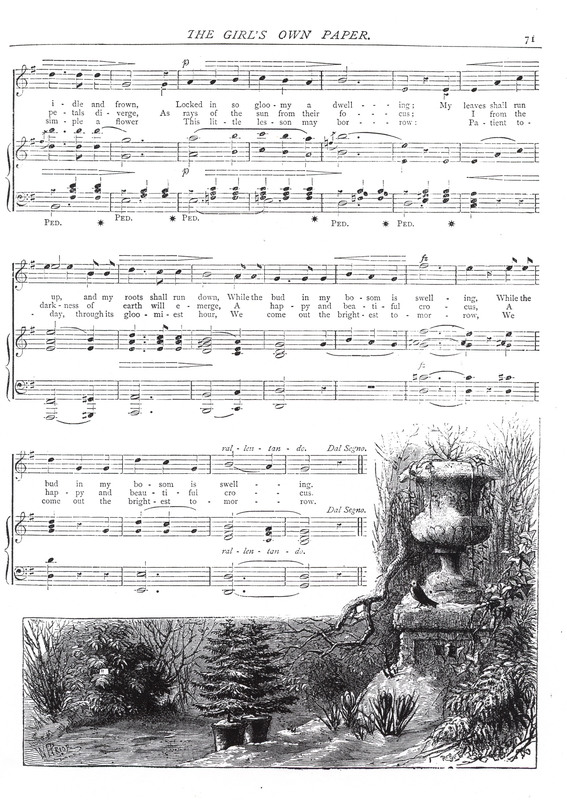 Although not a music journal, The Girl’s Own Paper (TGOP), published in London by the Religious Tract Society beginning on 3 January 1880, clearly considered music a worthy topic, which readers encountered in music scores, fiction, nonfiction, poetry, illustrations and replies to musical correspondents. Music in The Girl’s Own Paper: An Annotated Catalogue, 1880 – 1910, lists the many musical references found in the magazine, some of which are linked to nursing. At the end of 1889, A Templar’s commentary in Volume 11 of TGOP on ‘The Girls of To-day’ introduced the magazine’s readers to the modern woman and modern girl, forerunners of the New Woman whose birth was discussed so widely in the periodical press during the 1890s. The author rejoiced that a thorough education, broader interests, sounder judgments and more lively outdoor exercise and recreation set today’s young women apart from their predecessors. The debates about women who sought higher education raised the troubling issue of their marital status. Much was made of female graduates’ desire not to marry because the domesticity and household management it entailed would inconvenience their intellectual pursuits. A parallel discourse in the press centred on those spinsters in need of gainful employment often requiring prerequisite education or specialised training to prepare them for the world of work. While not a focus of TGOP, the spinster nevertheless was encountered in nonfiction and fiction about the most popular employment opportunity among the magazine’s readers – professional nursing. In its first two decades of publication, TGOP included occasional articles about employments for girls, such as millinery, pharmacy and sanitation and hygiene. Judging by the number of replies in the Answers to Correspondents columns during the 1890s, civil service employment was on the minds of many readers, particularly clerkships in the post office. If replies in the Answers to Correspondents columns offer a representative sampling of the employment that TGOP readers most desired, however, visions of becoming a nurse topped the list. A nurse topped the list in a competition in Volume 18. Agnes Eugenie Smith of the Nursing Institute in Sunderland described her work in an essay that won first prize in a TGOP Competition for Professional Girls; two other nurses in Wakefield and in Guildford received honourable mention. ‘It is no play – far from it! downright hard and earnest work,’ Smith wrote. Nursing, both amateur and professional, continued to capture the attention of TGOP and its correspondents in the first decade of the twentieth century, but correspondents were particularly interested in asylum nursing. Why asylum nursing? Strides had been made in the last half of the nineteenth century to replace containment and coercion of patients in asylums with care and cure instead. A reform was underway to recognize mental illness as a disease and to make care for those patients more like that given in general hospitals rather than the less than commendable care associated with Britain’s treatment of the insane. Just as the introduction of trained nurses into general hospitals in the previous century had brought a more humane approach to the care of medical patients, likewise the introduction of trained nurses into asylums could, it was hoped, do the same for the care of mental patients. Perhaps A.K. stood a better chance of getting into a private mental asylum as a musician. 1 Martha Vicinus, Independent Women: Work and Community for Single Women 1850–1920 (Chicago and London: University of Chicago Press, 1985), 96. 7 Punch, 7 December 1889, 267. Oh How They Loved to Sing! Although not a music journal, The Girl’s Own Paper (TGOP), published in London by the Religious Tract Society beginning on 3 January 1880, clearly considered music a worthy topic, which readers encountered in music scores, fiction, nonfiction, poetry, illustrations and replies to musical correspondents. 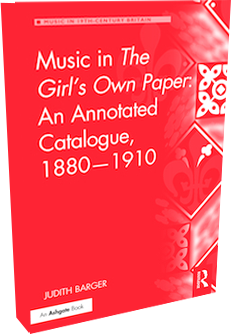 Music in The Girl’s Own Paper: An Annotated Catalogue, 1880 – 1910, lists the many musical references found in the magazine. 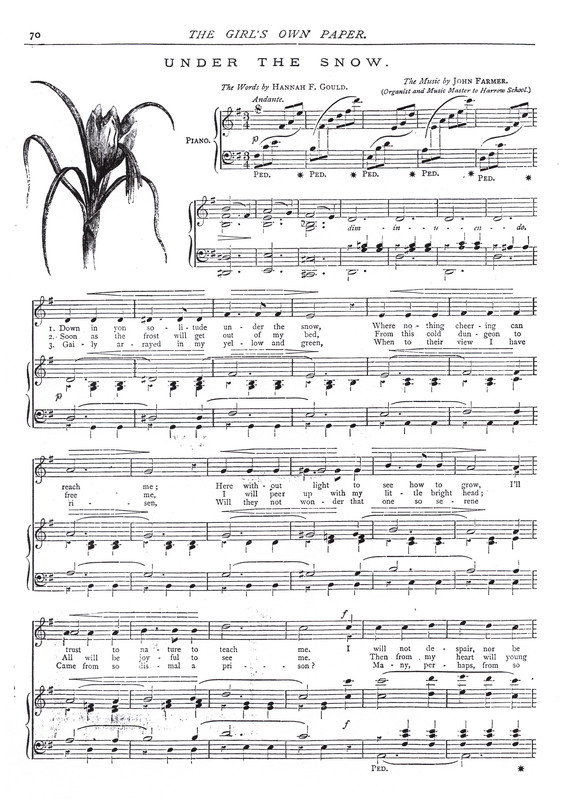 TGOP offered vocal sheet music in most of its weekly issues. The first, ‘Under the Snow’, is a two-page vocal solo with piano accompaniment composed by John Farmer, organist and Music Master to Harrow School, to words by nineteenth-century American poet Hannah F. Gould. The text encourages patience, like the crocus under the snow, in today’s gloomiest hour, for tomorrow will be brighter. [Volume 1, pp. 70–71] The piece gives an idea of the level of musical proficiency readers were expected to possess. Moving between minor and major modes, the piece with its 3/4 time signature has a simple waltz accompaniment that ends in the major mode. The even simpler vocal line beginning on the D above middle C peaks on F sharp a tenth above. Correspondent Zena Rosckma was told in the same volume that the hostess or daughter of the house always should sing first before asking her guests to do so. [Volume 1] And listeners should not interrupt the singing with conversation – an expected courtesy reinforced in the magazine’s nonfiction and fiction. The stage was set, literally and figuratively, for messages that the magazine conveyed to its readers about the role of music in their lives. In ‘Higher Thoughts on Girls’ Occupations’ in Volume 4, Alice King’s voice was the first of many in TGOP’s ongoing crusade against the nuisance some would-be musicians were to others. Girls with musical aspirations fall into two categories – the bullfinches and the parrots – King wrote. The first group, who show evidence of talent at an early age, should be nourished in their musical studies. The second group should be encouraged to spend their time in other, nonmusical pursuits. Fiction reinforced the message. In ‘Three Years of a Girl’s Life’, serialized in 17 chapters in Volume 1, Clara Henderson’s singing voice is like a peacock’s pitched an octave too high; her sister Alice’s contralto is reminiscent of a bird with a cough. In Eglanton Thorne’s ‘Her Own Way’, serialized in 28 chapters in Volume 16, Juliet Tracy wants to be a public singer, for its splendid life standing before an audience with every eye on her, ‘listening spell-bound to her voice’. [p.146] When permitted to take singing lessons from an Italian master, Juliet reads into his words only what she wants to hear rather than the truth, letting vanity fuel a dream that her vocal progress does not support. A number of mishaps highlighting the dangers of selfish actions and vocal study abroad leave Juliet penniless and thankful for the home to which she returns, where she puts her gift to good account, singing in her parish choir. ‘We cannot take our own way and God’s way, too,’ the author moralizes. [p. 227] Myles Foster had voiced a similar message in ‘Singing in Church’ in Volume 5: readers who pay for expensive singing lessons to master ballads during the week should give equal, careful and prayerful attention to singing church hymns in congregation and choir stalls on Sundays. The magazine made a clear distinction between those girls who pursued music as a pastime and those who pursued it as a profession, and most heroines who took the latter route eventually left it for the more enduring fame of marriage and motherhood. Eighteen-year-old Odette Gerard, in ‘Odette: Soprano: A Story Taken from Real Life’, serialized in 42 chapters in Volume 27, travels to Florence to study voice on a meagre £50. When at the end of two years her money has run out and she learns it will take two more years of training to make a credible debut, the discouraged singer marries a British physician who has been hovering in the background and returns to England to take up ‘that other song, the song of love and home’. [p. 451] Odette’s story illustrates the premise of Madame Melba’s article ‘Why So Many Students Fail in the Musical Profession’ printed in Volume 30 of TGOP. The well-known vocalist offers practical advice concerning young women who flock to the Continent, lured by the glamour of a professional singing career, but who lack the true talent and adequate finances to sustain their vocal study. 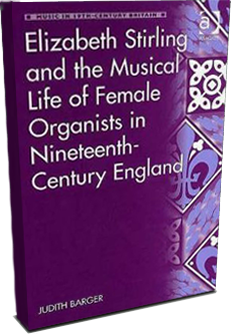 * Complete citations may be found in Judith Barger, Music in The Girl’s Own Paper: An Annotated Catalogue, 1880 – 1910 (London and New York: Routledge, 2017).